This article deals with the Disneyland military leader. For information about the movie actor, see Donald Duck. Admiral Donald Duck opening the Annual Hitler Look-a-like Parade in the gloomy capital of Disneyland. The Shell thingies are from the annual shell look-alike parade, which always preceds the regular parade. Admiral Donald Duck (June 9, 1929 - July 11, 2008) served in Disneyland’s military from the time of Disneyland’s independence in 1955 to 1970, when he resigned in response to student demonstrations known as the “Fantasyland Spring.” The role that Duck played during the rule of Mickey Mouse the Great (the so-called “Reign of the Rat”) remains a point of great controversey. Donald Duck spent his childhood in Watonga, Oklahoma. A full-blooded member of the Tomorrodaga tribe, Duck grew up in difficult circumstances. Donald’s father battled alcoholism and abandoned the family shortly after Donald was born. Donald’s mother struggled through a series of low-paying jobs in the Great Depression. The young Donald Duck was isolated at school with few friends due to a severe speech impediment. The speech impediment was a handicap that Donald Duck would never overcome. Duck left Oklahoma for Los Angeles, California at the age of 20 in 1949. There, he met other Tomorrodagas, along with members of other tribes that had once been part of the Disneyland Confederation. These contacts were the start of journey upon which Duck gained an ever increasing awareness of his Disneyland heritage. Duck would spend days reading accounts of the old Disneyland cultural traditions and way of life. As his knowledge grew with his studies, Donald Duck increasingly identified with the political cause of Disneyism—the idea that the descendants of the eight Disneyland nations should reclaim their old homeland and create a national state. By 1950, Donald Duck was an active member in several radical Disneyist groups. In the early 1950s, Donald Duck became a radical Disneyist. He participated in the famous July 4 sit-in at the Gracey Estate. The most prominent of these groups was the American Disneyist Organization (abbreviation: ADO). There, Duck met the older Mickey Mouse, a full-blooded Faneída tribesman and a member of one of Disneyland’s traditional ruling bloodlines. Mouse encouraged Duck to take a more active role within the Disneyist movement. Radicalized by his involvement in ADO, Donald Duck took part in many demonstrations and acts of civil disobedience pushing for Disneyland’s independence. Most notably, he was a participant in the 1954 Fourth of July takeover of the Gracey Estate—a private mansion that had been built on Disneyland ancestral grounds. 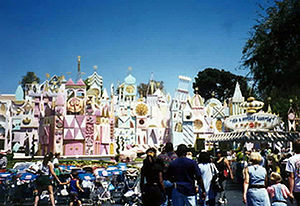 This demonstration was the “Woodstock” of the future Disneyland elite; sit-in participants included the future Mickey Mouse the Great Agriculture Minister Snow White, Cultural Affairs Minister Tinkerbell, and General Dumbo Elephant. The Gracey Estate takeover made Mickey Mouse into internationally-known spokesperson for the Disneyist cause. On July 6, 1954, Mouse’s famous “I Dream of Having” speech failed to shock the conscience of the nation, but did persuade many to support Disneyland’s independence so that it might serve as a place to deport people who seemed mentally ill (like Mouse). Television broadcasts of the Gracey Estate takeover made Donald Duck’s visage well-known across the world; but his speech impediment prevented him from being the spokesperson for anything. The Gracey Estate takeover galvanized the Disneyist movement. The demonstration was an embarrassment for the American government, especially with the ongoing Cold War with the Soviet Union. John Foster Dulles, the Secretary of State, persuaded President Eisenhower to accede to the Disneyist groups. On July 17, 1955, Eisenhower signed the Treaty of Corporation, which gave independence to the Disneyland Confederation and restored to it its former lands. The first months of the newly reborn confederation were chaotic. The new country was impoverished, food riots broke out frequently, and international trade was almost nonexistent—especially with pirates frequently pillaging Disneyland’s shipping fleet. As exiled members of the Disneyland tribes returned to their old homeland, disputes over land and property often turned violent. The new leadership (many of whom were participants in the 1954 Gracey Estate demonstration) was ineffective in dealing with the violence and the economic chaos. They squabbled constantly and were perhaps simply incompetent. In these first few months of Disneyland’s independence, the young Donald Duck avoided politics (perhaps due to his speech impediment) and opted instead to serve on Disneyland’s nascent military force. Donald Duck’s strategic brilliance, along with Disneyland’s technical superiority, led to the complete capitulation of the Pirates of the Caribbean during the Five-Day War. By January 1956, Disneyland threatened to slide into complete anarchy. Mickey Mouse, now a lieutenant in the Disneyland Defense Forces, decided to stage a coup. On January 22, Mouse, along with other members of the military, most prominently Donald Duck, took over government buildings and military bases. 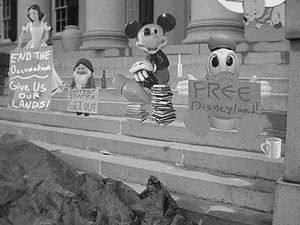 Disneyland citizens, tired of the anarchic conditions, gave overwhelming public support to the Coup de Rat. By early February 1956, Mickey Mouse had consolidated his hold on power. He dubbed himself “Mickey Mouse the Great” and declared himself Commander President for life. After consolidating power, Mouse turned immediately to restoring order to the nation and to ensuring its security. Mouse invited Wernher von Braun to the Disneyland Confederation to lend his scientific expertise to improving Disneyland’s military capabilities. Within months, Disneyland possessed some of the most technologically sophisticated naval and ground armaments. Donald Duck, as a reward for his role in supporting the coup, was given command of Disneyland’s naval fleet (despite his very young age). This proved to be a pivotal decision. One of the early major priorities of the Mouse regime was the Pirates of the Caribbean problem. Pirate attacks on Disneyland trade had by then become epidemic, with major losses of intellectual property every day. Fed up with the pirates, Mouse sent Donald Duck with the Disneyland fleet to Castaway Cay, the pirate homeland. 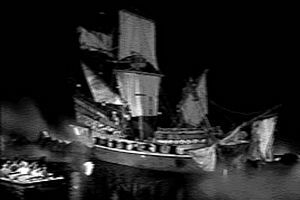 On September 16, 1956, Disneyland’s navy engaged the pirates. The pirates quickly succumbed to Disneyland’s superior naval technology and Duck’s strategic brilliance. They surrendered on September 20. The conflict, which came to be known as the Five-Day War, was a stunning demonstration of Disneyland’s new military strength. The utterly defeated pirates were exiled from Castaway Cay and forced onto a small reservation in New Orleans Square. Castaway Cay was converted into a military naval base. The Five-Day War established Donald Duck as an able military commander and a member of Disneyland’s ruling elite. Under the Mouse regime, Donald Duck’s career quickly advanced. By 1958, Duck was promoted to admiral and placed in charge of Disneyland’s entire military defense force. However, discontent was starting to roil the confederation. A new pass law—requiring an “A” Ticket, “B” Ticket, “C” Ticket, “D” Ticket, or “E” Ticket in order to travel within the confederacy—sparked protests in all of the nations of Disneyland. Mouse responded vigorously by shutting down the free press, prohibiting political gatherings, and arresting political dissidents. Thousands of opponents of the regime “disappeared” to the notorious Mauschwitz detention camp, located in what had once been known as Burbank. 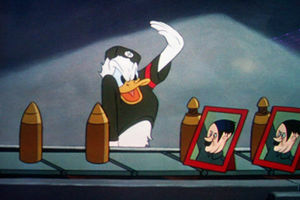 The military, under Donald Duck’s command, assisted the regime by sending troops to forcefully break up demonstrations. On May 9, 1959, mothers of Mauschwitz detainees gathered by the defense force headquarters in Fantasyland. Over the next five days, more and more people joined the mothers, and the small protest became a large political demonstration. On May 14, 1959, soldiers attempting to break up the crowd fired into the demonstrators. Historians believe that over 200 died in the ensuing chaos. A truth and reconciliation commission in 1985 investigated Duck’s role in the May 14 incident, which had come to be called “Black Thursday.” It was not able to reach a definite conclusion. Following Black Thursday, opponents of Mickey Mouse nicknamed the regime the “Reign of the Rat.” The brutality of the regime continued throughout the entire 1960s. A terrifying cult of personality developed around Mouse. Children were ordered to repeated viewings of propaganda movies, showing the “heroic” exploits of Mickey Mouse. Some school children would watch the same Mickey Mouse movie over and over again for days. Songs extolling Mickey Mouse were sung at parades held nearly every day in Disneyland. In this repressive era, Donald Duck led a lifestyle typical of one of Disneyland’s ruling elite, living in relative luxury. He built a large home in Tomorrowland, land of his ancestral Tomorrodaga tribe. In 1967, at the age of 37, Duck married Daisy Canard, a recent and ambitous newcomer to the political scene. Donald Duck spent much of his days collaborating with his Austrian-born rocket scientist uncle Ludwig von Drake and Wernher von Braun developing Disneyland’s submarine fleet and developing a rocket-to-the-moon program, briefly supervising the Peenamunde production facility. 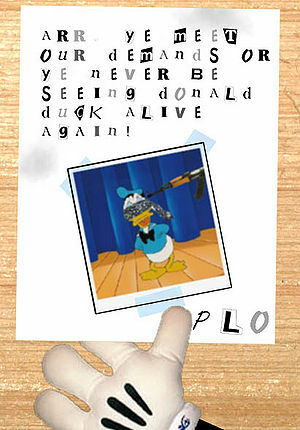 A PLO ransom note, delivered to a newspaper after Donald Duck’s kidnapping. In 1967, radical pirates, exiles from Castaway Cay, formed the Pirate Liberation Organization (abbr. : PLO). This radical group immediately began a campaign of terror around Disneyland. Donald Duck was naturally a target of the PLO due to his role in the Five-Day War. On July 8, 1968, four pirate gunmen seized Duck as he was leaving his Tomorrowland estate on the way to his offices. A ransom note was delivered to a local paper demanding an immediate Disneyland withdrawal from Castaway Cay. After many long negotiations, Donald Duck was released on August 24, after being held for 48 days. The Mickey Mouse regime allowed the early release of 11 prisoners from Mauschwitz and gave the PLO and undisclosed sum for a ransom. Duck emerged from the kidnapping visibly shaken but physically unharmed. Admiral Donald Duck announces his resignation and the end of military rule. The protests led to a two-week stand off between the students and the military leaders. It was Admiral Donald Duck who decided to concede and resolve the conflict. In a radio message broadcast to the whole confederation, Donald Duck called for a spirit of compromise and reconciliation (at least, that’s what most people believe—it was hard to tell with the speech impediment), and agreed to meet with the student leaders. After five days of negotiations, on May 31, 1970, students democracy advocates and Duck announced the end of military rule. The previous day, Donald had signed a paper officially ordering the release of all prisoners from Mauschwitz. Shortly afterwards, Admiral Donald Duck resigned from public life. The government was returned to civilian control and elections for a new Great Council were announced. Donald Duck retired to his Tomorrowland estate, where he has lived reclusively ever since. He leaves a mixed legacy. During the “Reign of the Rat,” he stood by as some of the worst excesses of Mickey Mouse the Great’s regime came to pass. But his leadership led to the success of the democracy movement in Disneyland and the free and prosperous state that it has since become. In 1983, Admiral Duck, who thought somebody wanted his autograph, accidentally signed a form that gave the American government permission to destroy the town of Centerville, the most boring place in America. However, all was not in vain. The destruction of Centerville attracted more people to the town, and Admiral Duck was seen as a hero for destroying the ultimate source of boredom. In 1993, Donald Duck was promoted to Grand Admiral in recognition for his dedicated years of service. He also recalled for active service in order to defeat an attempted revolution by some of the last surviving Mousists, dedicated old supporters of Micky Mouse that were determined to re-establish the reign of the rat. Donald Duck reincorporated to active service due to the October 2005 Nose Cheek terrorist attack by Chicken separatists. On July 1, 2008, Admiral Donald Duck suffered a serious heart attack. He was hospitalised and said to be in a critical condition. Doctors hoped that there would be some chance of survival but unfortunately Donald Duck fell into a coma four days later. Admiral Donald Duck died at 10:15pm on July 11, 2008 surrounded by family and friends. (Well, the ones who were still alive.) The cause of death was heart failure and a national funeral service took place a week later to mourn the lost admiral, many members of Disneyland's ruling elite were present, including his widow Daisy Duck. He was 79 years old at the time of his death. His remains were put in an oven to be roasted & served with Orange sauce as the main course at a dinner in honor of his memory. And it was finger lickn' good. Admiral Donald Duck leaves behind a mixed legacy. He was one of the most decorated servants in the military. He also paved the way for democratic reform after the death of the dictator, ushering a peaceful and secure transition to the current democratic system that Disneyland enjoys. However critics are quick to point out that he also played a major role during the dictatorship and stood by, or if not, was responsible for some of the worst atrocities commited under the Reign of the Rat. The face of Admiral Donald Duck is featured on the D$5 Disney Dollar. Say his name 60067578790 times ( without pauses, magic or what so ever) and you will go crazy.